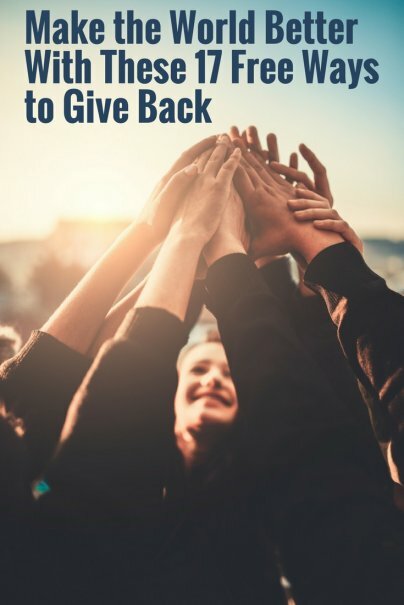 Giving back feels good and offers support to those who need it, but it can sometimes feel like the only contributions that make a difference are financial. While donating money to charity or to community members in need is a wonderful way of giving back, monetary donations can be out of the reach of some budgets. Even if you don't have the finances to write checks to your favorite charities, you can still give back without spending a single dime. Here are 17 entirely free methods of making the world a better place. Giving your time to a charity or an organization you care about is one of the most selfless ways that you can give back. There are a number of ways to volunteer that will match up with both your interests and the needs of your community. Volunteermatch.org brings together local volunteers with local nonprofit organizations that need help. You can search for a cause that means something to you, and offer your time, expertise, or services. Idealist.org was created to connect idealists with opportunities for collaboration and action to bring their good ideas to life. With more than 120,000 organizations listed and 1.4 million monthly visitors to the site, you can connect with other people who share your ideals. If you'd like to make a difference in the life of a local senior citizen, sign up with ElderHelpers.org to connect with a local senior in need. You could volunteer to help with anything from running errands to gardening and housework to entertaining. Volunteers with ProjectSunshine.org bring arts, educational, and social services programming to children living with serious medical challenges and their families. Volunteers can work to create program materials and deliver these programs on-site to the children. If you love to run, then volunteering with Girlsontherun.org could be a great fit for you. Volunteers coach a group of girls through 10-12 week running programs that include physical activity and a service project. You'll help empower young women to be healthy, confident, and more connected to their communities. SkillsforChange.com calls itself a microvolunteering site, similar to microlending. Volunteers share which types of causes they care about and what skills they can offer, and the site matches them with organizations that need help. Catchafire.org wants professionals to use their skills to make a difference. You can browse opportunities based on causes, needed skill sets, and time commitment, and then apply for opportunities. While we all know that we can drop off unused clothes and household items at Goodwill or the Salvation Army, there are many more ways that our unwanted items can help others in need. Fashion conscious altruists can use their fashion for good with UnionandFifth.com. Simply select which charity you would like to benefit, download a free shipping label, and clean out your closet. Union & Fifth will sell your clothes and send 75% of the sale price to your chosen charity. Gently used business attire can help disadvantaged women to succeed at work through DressforSuccess.org. Find an affiliate location near you, and drop off your unneeded office wear. Worn out athletic shoes can be given a new life as part of tracks, playgrounds, outdoor courts, or other places to play through the Nike Reuse-a-Shoe program. This nonprofit program will distribute your gently worn shoes to people in need all over the world. You can find a local drop off location on Soles4souls.org, and you can also organize a shoe drive to increase your impact. If you don't know what to do with your old cellphone or other digital electronics, the NCADV has partnered with Cellular Recycler to collect these items, and refurbish and sell them. The money from these sales goes to support the NCADV programming that helps to stop domestic violence. If you have an old cellphone that is still functioning, donating it to Cellphones for Soldiers will allow a deployed service member the ability to call home. This heroic charity works to grant the wishes of terminally ill children. To cover the travel for many of these wishes, Make-A-Wish accepts donations of airline travel miles from certain airlines. This can be a great way to make use of the miles you collect. Most of us tend to spend our days in front of the computer, so why not use that time to give back? This is exactly like the Amazon store you already know, but when you sign on with AmazonSmile, you are allowed to choose any one of over a million 501(c)(3) charitable organizations to benefit from your shopping. Each time you make a purchase, AmazonSmile gives 0.5% of the purchase price to your charity. Rather than taking another '90s-themed quiz, why not take a break with FreeRice.com? This site asks vocabulary, grammar, math, science, foreign language, history, geography, and SAT test prep questions. For each correct answer, the site donates 10 grains of rice through the World Food Programme. Believe it or not, just clicking on a button can help provide mammograms for underprivileged women, food for hungry people, meals for veterans, therapy for autistic children, research for Alzheimer's and diabetes, books for underprivileged children, and protection to the rain forest. The site the GreaterGood.com offers clickable buttons for each of these issues, and your click will help to provide those services. It takes approximately 45,000 clicks to provide one service, and each user is limited to one click per day, but you can click each issue's button every day. Clicking here once a day can be a completely painless good deed.